I think I am right in saying that some backpacking stoves should not be used with propane solely. Alan, I'm not aware of any. You just have to turn down the flame using the valve on the stove. The way that propane combusts isn't particularly different from other commonly used gasses for backpacking stoves. The only difference is the pressure. So turn it down. I wish I could remember where I had read it or if I was just mistaken. I trust your knowledge Jim so I will go along with you. Keep up the good work your posts are extremely helpful. Thanks. You definitely can get into trouble with 100% propane if you turn up a stove too high. The vapor pressure is much greater with propane. It's generally fairly safe -- PROVIDED that one is careful. Open the valve slowly. Good info. 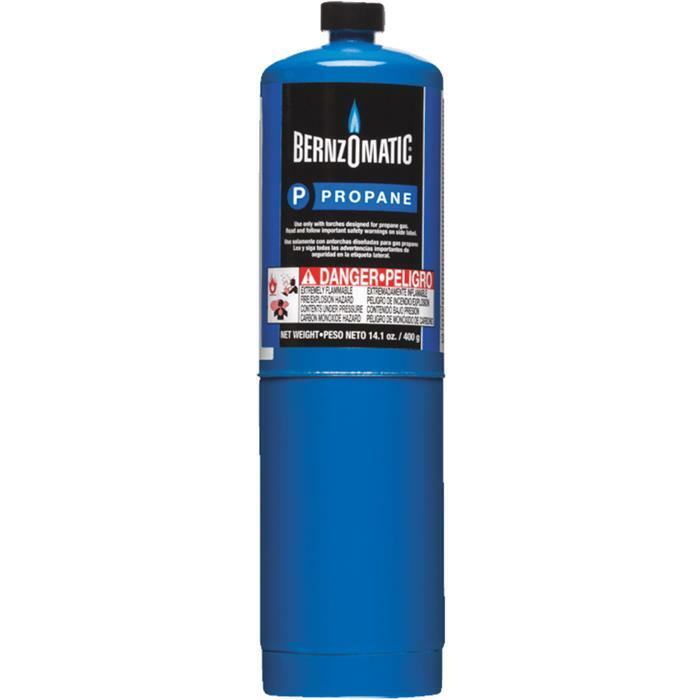 Probably not stated because it's obvious, but if weight and space are a concern, these 16-oz propane canisters are large and heavy compared to the isobutane canisters, but for some trips might be an okay option even before considering the temperature and availability advantages. Some might use a canister-mounted stove rather than a remote stove, which is doable, but I recommend securing the canister in some fashion. It will be very tall and tipsy otherwise. But, yeah, for most trips, just go with a propane-isobutane mix like MSR's backpacking gas canisters. I've got ideas for cold weather for those as well here on the blog. Look at December 2016. I see below that you caught it that these are on eBay for $20 bucks -- basically the same as the 3X heavier Kovea model. Yeah, good point. For a person who just wants to use their summer backpacking stove infrequently on a winter trip, this is a nice piece of gear. Spend $20 on a little 1.2 oz adapter rather than $80 or $90 on a dedicated winter stove. Good point. I've integrated your point about a non-dedicated winter stove into the blog post. Thanks for that. We had a tough time last year with a hurricane in October in the southeast USA and lost power for days. I used my stove with canisters and rationed my fuel so I would not run out. If I had this adapter and a tank available I would have been in much better shape. ( And I own a kovea spider already!) So it a good solution to keep in mind for storm events. That is an excellent point. I may add that to my review. Dave, if you've got a good source for the Bernzomatic Ultra Blue canisters, hang on to them. They aren't made any more that I'm aware of. I"m not sure what the nylon wadding is that you're referring to. I have a couple of the Bernzomatic canisters, but I don't recall any nylon wadding. Did you cut open the canister? That's interesting that there's some kind of mesh inside. I'm a bit skeptical about such things. I think the propane content more than anything else is going to make the difference. On the Kovea, is the output of the adapter is adjustable with the little screw on the side? How about the G-Works, can the center pin turn for that purpose or is the notch only there for the assembly? Are you by any chance from Japan? Your screen name sounds like "good job" in Japanese. The G-Works adapter is not adjustable. If you were to go for instance in winter on Everest at 26000 ft (could you say, that 90% propane can go down to -60F ? (just thinking....http://winterclimb.com/articles/item/111-mount-everest-first-winter-ascent-1980) and considering the 20 Fahrenheit degrees (10 Celsius degrees) above the vaporization point ? Probably, yes, a stove can handle -60 F running on 100% propane. Of course at those temperatures other things can happen like seals becoming hard and brittle and the like. Generally, you should be fine, but if I were planning to venture out in such conditions, I would want to test my stove if at all possible in very cold conditions beforehand. As for running a Reactor on propane, I don't know that it's dangerous or going to harm a stove, but I don't know that it's safe either. I'm being very conservative here since I really don't know that it's safe for the person or safe for the stove. In cold weather, the vapor pressure of propane should not be so high that it would damage a stove. Again, I'm just being very conservative here. I updated my comments above about temperature and altitude restrictions. can I try the G Works adapter with it ? Will it work safe ? I haven't tried the adapter with that stove, but it *should* be safe provided that you start with the stove on low and turn it up slowly. You don't want to turn it up too high. Jim - Thanks for the warning about vapor pressure and regulator valves. If I'm reading the charts correctly, the vapor pressure of 100% propane at 32°F is about the same as a 30/70% propane/n-butane mix at 75°F (see e.g. 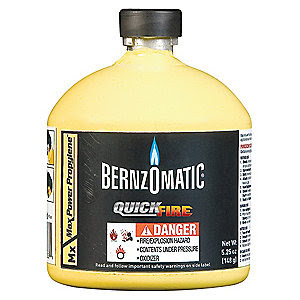 http://www.engineeringtoolbox.com/propane-butane-mix-d_1043.html). So in theory it should be okay to use a propane canister with a backpacking stove in cold conditions (below freezing). Do you agree with that logic? BTW propane canisters aren't that much heavier than standard backpacking gas canisters. A 16oz propane canister weighs 780g when full, about the same as two 8 oz backpacking gas canisters. I follow your logic. I haven't specifically checked the numbers, but in cold weather, I don't think having excessively high pressure is a concern at all. I'd be much more concerned above, say 70 F/20 C. Particularly below freezing, there should be no problem. Regarding weight. I have a couple of Coleman brand 465 g canisters of 100% propane in front of me. They weigh about 850 g each. The weights vary, but the lowest I've seen for a full 100% propane canister is about 840 g. By contrast, a 450 g Jetboil brand backpacking type canister weighs 660 g. That's a minimum difference of about 80 g (roughly 3 oz) for comparably sized canisters. Some Coleman 100% propane canisters weigh 870 g -- about 110g more than a comparable backpacking canister. That's about a quarter pound difference. I got the Kovea Spider and Kovea LPG Adapter (heavy!) and noticed that it sputtered quite a bit, even turned down low. I found it ran more smoothly in liquid feed mode (on a full green propane cylinder). However, on my most recent overnight trip (4500', 35*F), the setup didn't seem to work well heating water for breakfast. I began with the valve barely open, but found that the flame seemed to slowly fade, as if the valve was shutting. I had to keep turning it up. Keep in mind I was balancing that with not turning it up above 30% or patches of the flame would begin to sputter out, I assume from the higher pressure. I think I've had something similar on several stoves including the Spider. My theory is that as the pre-heat tube on the stove heats up the fuel in that section it rapidly expands and creates a back pressure when running in liquid feed mode. Exactly how each stove runs in this setup seems highly variable probably in part due to the variations in how much of the pre-heat tube goes over the flame. I think that ones with more pre-heat are more stable (small adjustments to fuel valve make little difference), whereas the Kovea Spider with a small amount of pre-heat is more finicky. That's my theory anyways. Sputtering is often caused by fuel that isn't fully vaporized. Have you tried it since then with regular backpacking fuel? The stove shouldn't fade on you in 35 F weather running on 100% propane. How full was the propane canister on your last outing, the one where it seemed to fade? Recall that the HD5 standard for propane (which is generally what you'll get in the US) allows for 5% "other" to be in bottles sold as propane. If you were toward the end of the bottle, then that last 5% may well have been butane in which case, you would definitely get some serious "canister fade." On the topic of alternative fuel source I've been experimenting with filling a butane canister with white gas then topping it off with about 10% propane. After warming up the stove I flip the canister and run the white gas with the propane staying at the top to provide pressure. So far it runs fine, but I still need to measure canister pressure and see how it runs in cold weather. My goal is to come up with a solution that runs well in very cold environments using a light weight canister and with lower pressure that straight propane. Fascinating. What stove are you running that with? I've tried out the fuel on several stoves. The Primus Omnifuel and Lixada Portable Multi Fuel both burned well after the pre-heating phase. That's no surprise as they are both made for canister or liquid fuel. Canister only stoves seemed to only work if they had a large preheat tube over the flame. Primus ETA spider and Optimus Vega did fine once pre-heated although not surprisingly they only had one setting, high. Kovea Spider and Fire Maple 118 seemed to never get the pre-heat hot enough and continued to put out a yellow flame. I was able to verify with a pressure gauge that the pressure in the canister is much lower than with high propane mixtures. Actually lower than regular butane. The fuel was about 45 degrees. I have it in the deep freeze now and will test it again at about -10 F. I may want to go with a higher propane ratio. So far the mixture seems to have some potential, but time will tell if it's actually practical. Pre-heat seems to be a little longer/trickier and getting the white gas into the empty canister is a small process to itself. Still it has been some fun experimenting. Be careful of that Lixada Portable Multi Fuel. It's a cheap knock off of the Kovea Booster+1. It is not the authentic Kovea product. It may be fine, but I really don't know. That's interesting what you're doing. Basically, you're developing a white gas stove that is self-pressurizing, a pumpless white gas stove. A fascinating idea. It makes sense that the stoves designed for liquid fuels are going to do better. You need a certain level of thermal transfer from the heat of the flame to the liquid fuel flowing through the fuel line. A white gas stove is going to be designed that way. A kerosene stove even more so. On the other hand, canister gas doesn't require as much heat in order to vaporize the fuel, so they deliberately would design them with less thermal feedback in mind. I have this adapter and the Kovea one. I like the weight of the G-works, but it doesn't work with 16 oz propane bottles that are made to be refilled. The Kovea works on both the disposable and refillable 16 oz bottles. The threads on the refillable bottles seem to be slightly thicker and won't allow the G-works to screw on all the way. Interesting. I haven't tried the refillable propane bottles. Good to know. when running a backpacking stove upright with Isobutane, you get a freezing canister since the vaporisation cools the canister, it's ok down to 10 F, a cozy is useless in this case. when running it inverted, you can go down to -12F without the problem of a freezing canister linked to vaporisation, however -12F being cold, the canister can start to freeze but a cozy would help here, right ? but in liquid mode, one could go even lower ? what would be the limit at sea level ? A one inch close celled foam cozy for the canister could be the answer to help running the propane in liquid mode without worries ? would the preheated tube come into play in liquid mode ? Dan, be careful of using rigid numbers like the 10 F and -12 F you mention above. It very much matters what fuel blend you are using, the temperature of the fuel more so than the air temperature, what elevation you are at, and whether or not you have a regulator valve or are running in inverted mode. I don't think you can have numbers quite as hard as you list (at least that's how I'm interpreting what you're saying). In upright mode, generally you are correct about a cozy. A cozy is typically of little help since the canister cools from within. However, if one were to put a hand warmer or other heat source inside, then a cozy could be of value. That said, it's still typically worthwhile to insulate the canister from the ground. With inverted operation, the canister will still cool from within, but to a far lesser degree. Here, a cozy might have actual value, particularly if one were to start (as I recommend) with a warmed canister. However, liquid water would be of even greater value than a cozy in most circumstances. Liquid water will always be above 32 F which should allow any propane-isobutane mix to work well, particularly in inverted mode. You could not go lower than the boiling point of propane (-44F) in liquid feed mode. You still need enough pressure in the cylinder to push the liquified propane through the fuel line and through the burner. Generally, you want to be about 20 Fahrenheit degrees above the boiling point of a fuel for good pressure although you could probably go a little bit colder in inverted mode/liquid feed mode. Would a pre-heat mechanism come into play in liquid feed? Uh, yes. Indeed, if you try a liquid feed without a pre-heat mechanism of some sort, you're going to have a fiery failure on your hands. A pre-heat mechanism doesn't just come into play, it is required. Let me repeat that for emphasis: You must have some sort of pre heat mechanism in place in order to use liquid feed in any fashion. A pre-heat mechanism has to supply enough heat to fully vaporize whatever fuel you are using. If liquid fuel actually exits into the burner, you'll have a fireball erupt like a volcano out of your stove. You must supply enough heat to the fuel to fully vaporize it before it hits the burner. one more thing, in propane mode, do you think altitude can help in inverted mode at -40F ? or does the stove work the same regardless of the altitude when inverted ? Next,the problem you are facing at -40F is how to keep liquid water for warming the canister...? as a result a cozy with a toe warmer inside is not that bad ? if this fails, you can still urinate on the canister ....that works ! or use a candle, at -40F a candle is not as dangerous for a canister pressure as it is at +90F..
then, if gas fails at - 44F, what others fuel can work down below ? what is the absolute limit and how to deal with it ? Dan, yes, the higher in terms of elevation that one is, the better a gas stove will work at a given temperature. At -40F at sea level, you are pushing the limits. You would want to have the capability to keep the fuel much warmer than that, say at least -20F, in order to have good pressure -- if you have true, laboratory grade propane. But of course you won't have lab grade propane; you'll have commercial grade propane which is only about 90% actual propane. So, don't count on -40F or -44F or any other number down that low. You have to be very conservative here until experience teaches you otherwise. At such cold temperatures, water is no longer a good mechanism for warming the canister. A candle would be fine, but I'm not sure if a candle will be enough. You'll probably want some kind of a Moulder Strip that channels heat back to the gas cylinder. You have to be exceedingly careful when mechanically channeling heat to the fuel, but that's probably what you'd have to do at such an extreme temperature. The other option is some type of white gasoline stove. Optimus used to make Arctic Fuel which was a highly refined white gasoline before the company was sold. I don't know if they're still making it. so would you be ready to do a stove bomb in -20F weather ? the canister would have yet to be too warm, would it ? when you get your priorities straight. Dan, yes, in temperatures that low, I would consider an "Alpine Bomb" type of set up. I think water will be too difficult to work with and keep warm. This bomb type set up is what I meant when I earlier said that one needs to channel heat from the burner back to the fuel. 1. Use only in cold weather. 2. Constantly check the canister by touching it with bare skin. If the canister is so hot to the touch that you can't rest your hand on it comfortably, then it's TOO HOT. You have to immediately take steps to reduce the amount off heat being delivered to the canister. I have not heard of the PALS system before today that I can recall. Well, this is a bit tricky. The HD5 standard for propane calls for a minimum of 90% propane, no more than 5% propylene, and the remainder can be any petroleum gas (methane, ethane, butane, etc.). The bottom line here is that you can't know exactly what is in the mix. In all probability, it will behave a lot like propane in terms of vaporization characteristics and heat produced, BUT it's worth it to be conservative which is why I'm recommending something on the order of -20F as a lower limit. Keep in mind that in upright use, the propane and higher vapor pressure gasses (e.g. methane) will burn off at a faster rate leaving the lower vapor pressure gasses (e.g. butane) in higher concentrations toward the end of the life of the cylinder. In other words, the last, say, 10% of your fuel will not perform nearly as well as the first 10%. One has to be prepared for this "canister fade" as it is sometimes called. Again though remember that it is the temperature of the fuel not the air temperature that matters. If you can channel enough heat from the burner back to the cylinder of gas, then you can operate at as low a temperature as you like. Of course you need to start with the cylinder warm enough in order to start the cycle. Now, all that said, do I believe that there will be good pressure in a 60/40 mix down to -27C (-16.5 F)? Well, it depends on how pure the propane they use is and what the other components are in the mix. In this case, at least 60% is n-butane which vaporizes at -0.5 C (31 F). So, no, I don't think this C300 canister will work well consistently at -27 C/-16.5 F. Maybe if you start with a fresh canister, keep it warm, and use it in inverted mode -- but not in standard upright mode. I don't believe it, not throughout the entire life of the canister. Yeah, those Ultra Blue canisters are great, aren't they? I wish they still made them. I picked up one of these a few months ago. It works great with my older Primus ETA Power Trail stove (remote canister) and my MSR WindPro 2/II stove (remote canister). FYI: My new Soto Amicus will not work with the G-works adaptor. The G-works adaptor is too narrow to fit the Amicus o-ring, so the valve never opens. Thanks for those data points. Interesting that it's working with a couple of remote canister stoves. I guess that makes sense in that a remote doesn't have the burner column right on top of the connector. Shame about the Amicus, but I actually think the remote set up is the better way to go. I've found that my Kovea adapter will not work with my Msr whisperlite universal. Does any one know if this G works adapter will? Problem is the universals canister valve will not get far enough into the Kovea adapter. Thanks. If I can dig it out, I'll give it a try. I have the Kovea steel adapter, the G-Works aluminum adapter, and two new (not yet on the market) Kovea aluminum adapters. If you don't hear back from me by early next week, feel free to drop me a little reminder note here. Thanks for all your help HJ. Hey HJ did you ever get a chance to try the g works adapter on the whisperlite universal? I have not been able to find my Whisperlite Universal. I probably stuck it somewhere clever when coming back from a trip instead of putting it into its proper place, but I can't for the life of me remember where. I'm not usually this scatter-brained, particularly on a stove that I like (stoves I don't like very much go into a bin and mainly sit). It's possible that I put it with my winter gear instead of my stoves, so I'll tear through that next. Such is the life of a gear-a-holic I suppose. Whoa! That is not good. So, the G-Works connector didn't fully seal to the Whisperlite Universal's valve block? Is that what happened? And when it leaked, the leaking gas caught fire? Yipes! What do you mean by "blow back?" I'm not familiar with that term. Oh my I appreciate all your help. I was hoping it would work the universal is the best simmer capable stove that I have. So Far! Lol. When I did my tests a few years back of the Whisperlite Universal, I was very impressed with its ability to simmer, particularly on kerosene. Has anyone tried G-Work's adapter with an Optimus Vega? Kovea's LPG adapter works great with my Spider but I understand it won't work with the Vega unless you do something to lengthen the control valve's pin (which I'd rather not do). I took a chance and purchased the G-Works adapter from one of the many sellers on Amazon (Ebay prices were similar). I'm happy to report it works with both my new Optimus Vega and my old Kovea Spider (unlike my Kovea adapter which won't work with my Vega). The G-Works adapter is easier to use IMO as the knurled finish makes it easier to hand-tighten than the Kovea's polished hex shape. Thanks for writing up this great little accessory Jim! I was wondering if you or any of your readers have used the G Works with a Windburner stove. Here in Japan that would likely work well (usually not super cold, and lots of snow), but for visits to my native country Canada, there are times when it gets really cold but without much snow. Running on propane would be a nice option then. I know it would be a tall system, but with one of those plastic bases for the propane cylinder, do you think it would be stable enough? I have the hanging kit as well, so that would be lighter and definitely stable, but I like having options.